Welcome to the world of The Gilded Age. 1877. The full dawn of Industrial Revolution has collided with the twilight of the age of magic and alchemy, leading to a most curious progeny: self-aware clockwork men. Man-made machines, with clockwork gears and steam-powered joints, serve man even as the followers of the old ways continue to nurse growing resentment of these new creations. Each issue of The Gilded Age is a complete story ("Done in One") focusing on different members of the Branning Troupe. This allows for a wide variety of stories to be told: heists, western, horror, and fantasy. John McGuire is an engineer by day and writer by night. He attended Georgia Tech to obtain a civil engineering degree. While his left brain absorbed information on E-mag, Calculus, Statics, Dynamics, Structures and Road Design; his right brain devoured the works of Jack London, Mark Twain, Anne Rice, Alan Moore, Kurt Busiek, and Mark Waid. Today, John is a registered professional engineer and professional writer. His love and collection of comic books began when he was 10, in a convenience store in Waycross, Georgia. It wasn’t long afterwards when he started writing his first comic related stories. This passion has continued throughout his adult life as he remains an avid comic book reader and collector. In 2002, he was a founding member of Terminus Media. It began as a writer’s collective in the back of the Dragon’s Horde Comic Book Store in Decatur, GA. Through the next decade Terminus, published anthologies in which John was both an editor and contributor. The Gilded Age, published in 2013, is his first on-going series. The relationship with Terminus also grew into some Work for Hire opportunities for both corporate and government entities. In 2009, John joined Headhunta Studios, a collective of Artists and Writers. 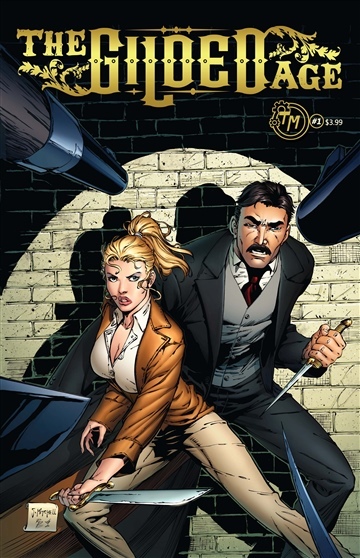 In 2013, Tiger Style was published by Arena Comics. John currently has projects in production for Arena Comics. In 2010, John took the story telling skills that he had learned and applied them to the writing of novels and short stories. His debut novel, The Dark That Follows, was released in 2013. 2014 saw the release of his second novel, Hollow Empire, as well as a Veronica Mars Kindle Worlds Novella, There’s Something About Mac. John McGuire currently resides in Suwanee Georgia with his wife, Courtney, and two cats: Westley and Inigo. He maintains that he would have been a Marine biologist, if not for Jaws.